A utility that enables you to open and analyze MSG file using Outlook MSG file forensics without needing the Microsoft Outlook email client. For the purpose of MSG file forensics, the Outlook MSG file viewer helps in previewing the email content of every message along with its proper formatting. Further, users can get details of every message like subject, sent date, details about its size in KB. The application has an interface which is styled just like Windows Explorer and offers you the facility to auto locate folders which contains MSG files. 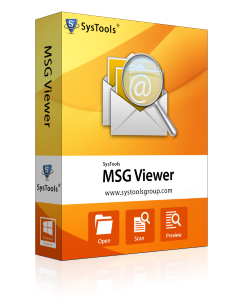 Once the Outlook MSG file Viewer loads, it starts with the scanning procedure and then provides an instant preview to analyze MSG file. The Outlook MSG File Forensics utility provides users the option to search within the email messages and attachments. With the help of this searching feature, you can put a specific keyword or phrase to filter out email and attachments. Further, you can add different search criteria to get better search results. To carry out a precise MSG File forensics, the software enables you to re-arrange the order of the list according to its attributes. You have the facility to sort out and view the Outlook MSG files on the basis of properties such as subject, sent date, received date, from, etc. How many messages can I examine with this software? There is absolutely no such limitation for analyze MSG files. You can view and open any number of messages. Would I be able to save the attachments of email messages? Well, the Outlook MSG file viewer Forensics Utility allows you to only view messages. It does not provide the facility for saving the attachments. Its performance is just brilliant! I am just amazed by its working. The software Outlook MSG File Forensics Utility really helped to analyze MSG files effectively." Being a forensicator, I usually had the problem of analyze MSG file as I had to look for Outlook. But this utility served to ease all my concerns.